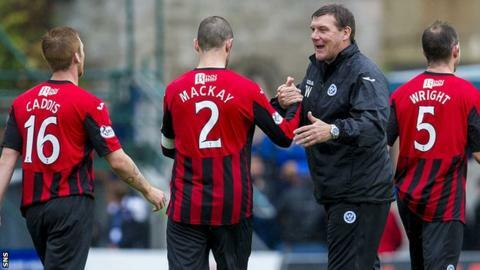 Tommy Wright believes his St Johnstone team do not get the recognition they deserve as they target a fourth-place finish in the Scottish Premiership. "We work on an extremely tight-run ship financially, which is correct, and we've achieved top six for the last four seasons in a row, which I think is remarkable," he told BBC Scotland. "I don't think we get the credit. "A lot of teams respect what we do but I don't think we get the respect, over this season and over previous seasons." The Perth Saints are fifth in the table, behind Tayside rivals Dundee United on goal difference alone. Their final two games of the campaign could scarcely be tougher, hosting Celtic on Friday evening and ending the season away to Aberdeen on Sunday 24 May. Northern Irishman Wright is proud of what the team has achieved this term. He said: "I've been delighted with the season - to get top six again, guaranteed fifth and going in to the last two games with a good chance of fourth, which may get us into Europe if Inverness win the Cup. "When you look at some of the bigger clubs who haven't done that, we definitely get the most out of the players. "On the back of the success we had last season we knew it was always going to be a difficult season, losing Stevie May towards the end of the transfer window, as well, so overall we've got to be pleased with what we've done this season." The manager believes the limited praise of his club is a combination of its geographical location, its size and its mid-table standing. "We are perceived as a small club and probably for a few years we were perceived as a yo-yo club, but we've got stability," he continued. "When you've got that level of consistency, and maybe because we're mid-table and not going for the league, that creates a 'well, we expect that of St Johnstone, they are always going to be mid-table'." He described his team's Scottish Cup victory over Dundee United last May - the club's first major trophy in 130 years - as his "best day in football", but he is in no hurry to seek success elsewhere. "I just want to do the best job I can and see where that takes me," he told BBC Radio Scotland's Sportsound. "If I'm at St Johnstone in 10 years' time, I'll de absolutely delighted. "If it means in a couple of years' time somebody comes in and wants me to go somewhere else, that's what's going to happen. "I just do my job. It's the way I've been brought up - just work hard; if you do that, you get rewards."